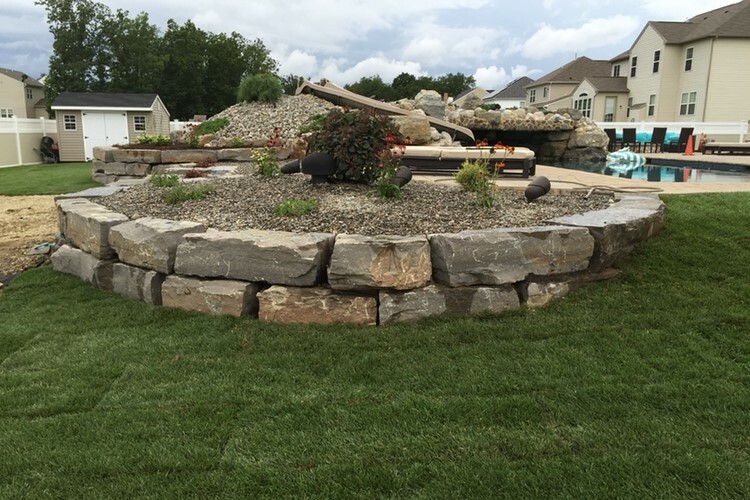 ALHG Provides Professional Landscape Design & Construction Services in West Ottawa, ON. 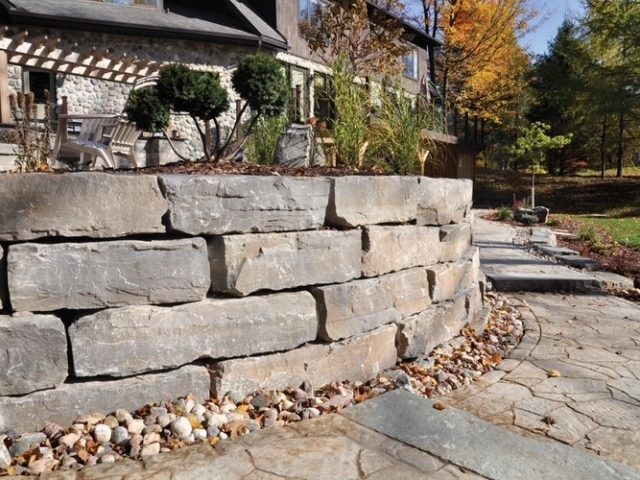 Retaining walls are a great way to enhance both the look and function of your landscaping. Commonly used as a solution to reclaim some flat land on a slope and uneven properties, retaining walls let you carve out functional outdoor spaces into a slope that can be suitable for new garden beds, new sections of lawn, patios, outdoor living spaces, and more. Alan’s Landscaping and Heather’s Gardens (ALHG for short!) is a family owned and operated landscape design and construction company based out of Ottawa. 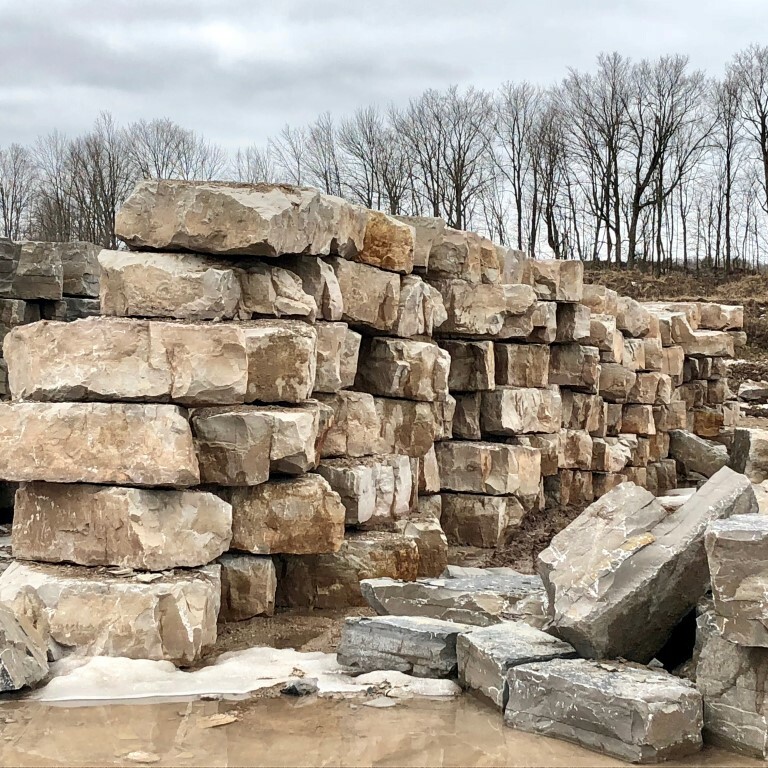 We specialize in the design and construction of retaining walls, stone steps, and patios using Armor Stone for both residential and commercial property owners. From a 50′ foot long retaining wall to hold back a slope on your property to much larger retaining walls on your terraced or sloping property. Alan and Heather will be able to provide you with a safe, properly constructed retaining wall solution for your needs that will benefit your specific property. 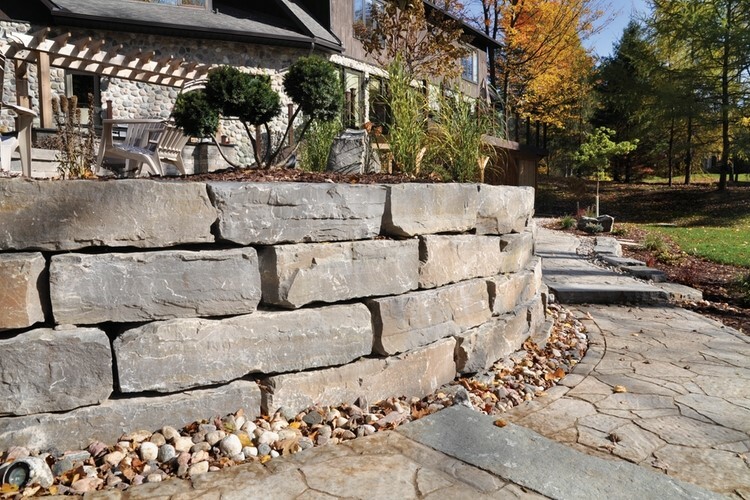 While retaining walls are designed and built to hold back earth and fill they will also hold back and channel water. The water that builds up behind a retaining wall is referred to as “hydrostatic pressure” and the external force of the material/fill held behind your wall coupled with the weight of the water is often enough to seriously compromise the integrity of your wall and even cause failure and collapse. A good drainage system should be an integral part of any retaining wall design. Depending on the type and shape of the Armor Stone used to build the wall there are a variety of ways to integrate sufficient drainage such as weep holes, lateral drains, blanket drains and also the use of very granular soil or fill. Don’t underestimate the external forces that are being applied to your retaining wall as there are many retaining walls throughout our area that have failed due to poorly thought out or non-existent drainage. Don’t let your contractor make this mistake! If you want your new retaining wall to last a very long time, understanding surcharge loads is very important to the stability of your wall. Be wary of a contractor who doesn’t explain this to you, if it applies to your wall. A surcharge load on a retaining wall is any load that rests on the surface of the soil close enough (directly above or within 4 feet) of the retaining wall to cause a lateral pressure on the wall. Maybe you’re parking a vehicle, boat, or an RV on top of the area? Maybe you’d like to build a decorative cedar fence along the wall for privacy? 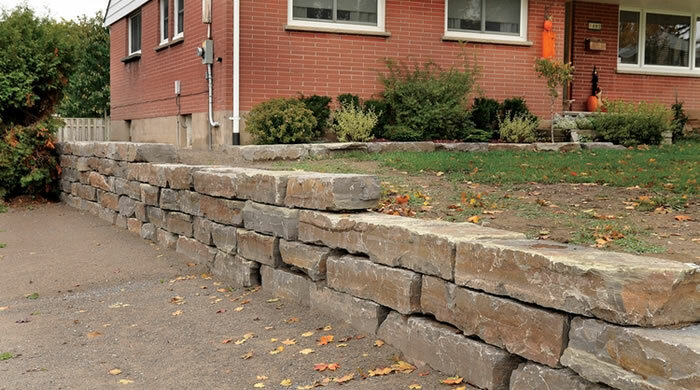 These are examples of a surcharge load and would require your retaining wall to be designed and built with a little more care and proper procedures. 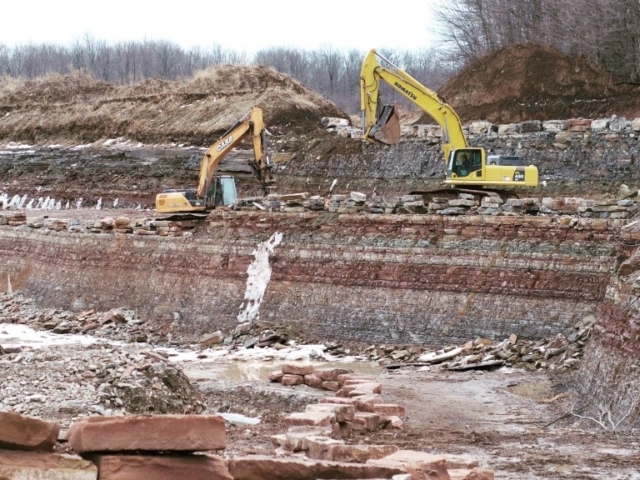 According to the Ottawa building codes a “retaining wall” means a structure which supports and confines a mass of earth or water where there is a change in ground elevation. Retaining walls that are over 1.2 meters (3.9ft) in height will usually require a building permit. In addition any retaining walls over 1.2 meters (3.9ft) in height must be designed and signed off by a geo-technical and/or structural engineer to ensure the wall is properly constructed for your site conditions and intended purpose (like a surcharge load). This does not account for any covenants that might be on your property. When building a retaining wall on your property that is designed to hold back tons of soil and earth there is very little margin for error. 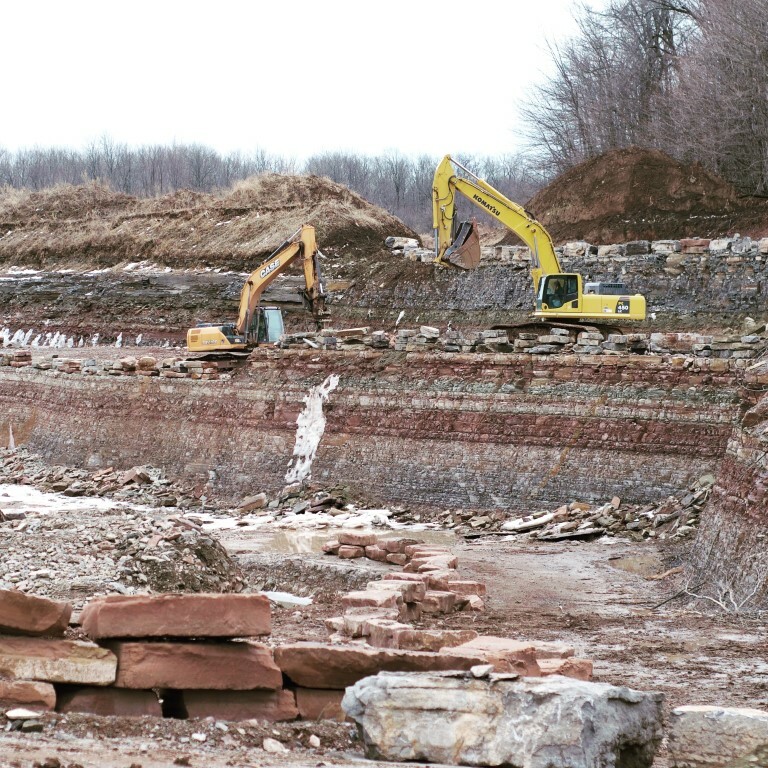 Depending on how large your retaining wall and what purpose it’s for, we may work directly with a geo-technical engineer to ensure your wall is built the right way. We determine how many feet of retaining wall you need. We consult with you on the type of stone you’d like your retaining built with. We’ll get to work on the schedule start-date and build your new retaining wall. The end result will be a beautiful new retaining wall on your property. The amount of work required to build a retaining wall can vary widely from project to project. The slope of your property, the amount of earth your retaining wall must hold back and the overall accessibility of your property will all contribute to the final cost. Remember: Retaining walls that are in excess of 1.2 meters in height (3.9 ft) will require a building permit and must be designed by a geotechnical engineer. We are more than happy to arrange and organize complicated projects such as this. 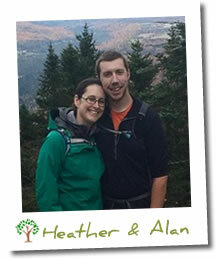 Why Choose Alan and Heather To Design And Build Your Retaining Wall? 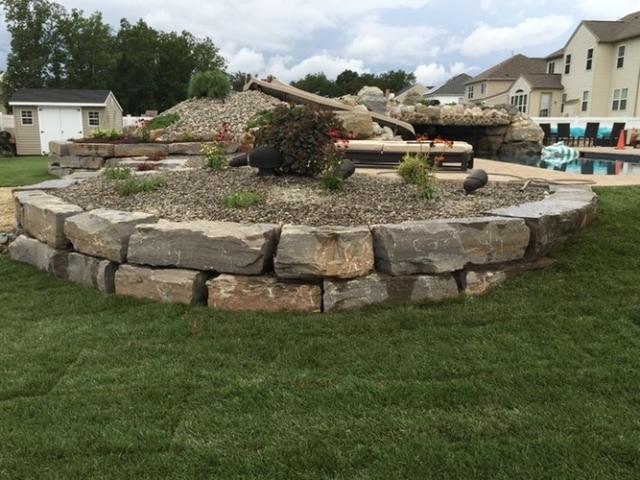 When you choose ALHG for your new retaining wall you are partnering with a small, locally owned, family run landscaping business. With Alan specializing in construction and Heather specializing in landscape design they are the perfect team to help you transform your property into the envy of your neighborhood. 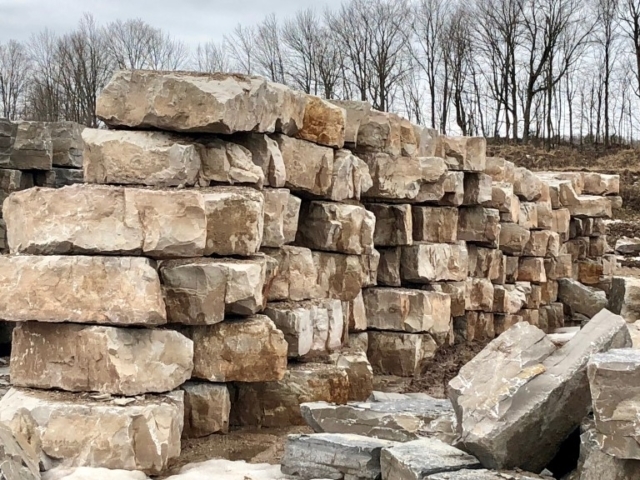 The ALHG team is large enough to design and install retaining walls of all sizes but we’re still small enough to give your new retaining wall the specific care and attention it needs to be safe, solid and aesthetically pleasing. We believe in providing great service and value along with complete customer satisfaction with every project we complete! We will conduct ourselves like true professionals on your property at all times, leaving no trace behind but your beautiful new retaining wall! If you’d like an estimate for retaining wall construction or replacement please give us a call (343) 262-4769 or fill out our contact form and we’ll get right back to you. ALHG is a locally owned and operated outdoor construction and landscape design company based out of Ottawa, ON. We serve Ottawa and surrounding areas.